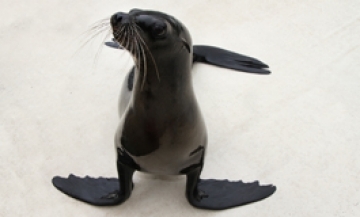 My Story: Diamond is the newest member of DRC’s sea lion family. This little gem was born at Sea World Orlando. 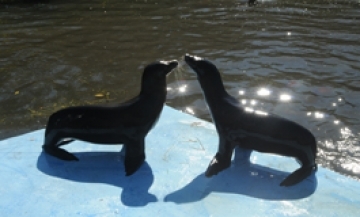 Her mom, Topaz, was born there as well, and her dad, Rocco was rescued by Sea World when he was just a pup. Guests will recognize Diamond by her very dark color when she is wet that turns silver when she is dry. She has beautiful, brown, wide set eyes and large front flippers. 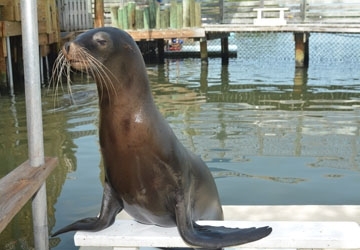 Diamond enjoys spending time with the rest of our sea lion family. She is particularly close with Lina and the two girls are often seen hanging out together. She enjoys playing with toys and regularly plays with them between sessions.